Our beautiful 2 bedroom fully air-conditioned and heated apartment is situated on the ground floor in the Mediterraneo 1 gated secure complex in Gran Alacant (at the bottom of the hill) and a few steps away from 2 beautiful pools. Also just a 10 minute drive away from Alicante Airport, but away from the flight path so there’s no aircraft noise. Conveniently situated just a 10 minute walk away from the fabulous blue flag sand dune Carabassi beaches, adjacent to El Clot de Galvany nature reserve/bird sanctuary and a 2 minute walk away from a fantastic selection of excellent bars, restaurants and a mini-market, it's a fantastic base for the perfect holiday! There are 2 beautiful large swimming pools and a children’s paddling pool (only 15 metres from apartment), tennis court, boules, lovely gardens, small children’s play area and covered private car parking space for guests to use during their stay. FREE unlimited high speed fibre-optic Wi-Fi is available throughout the apartment. There are tennis racquets and balls for the tennis court and boules for the boules court and also beach bats, balls, buckets and spades in the apartment for our guests to use during their stay. •	fully equipped kitchen containing everything you will need, including electric oven, digital ceramic hob, microwave, fridge/freezer, washing machine, cafetière, kettle and toaster, plus iron and ironing board. •	Spacious garden area with 4 large sunbeds for sunbathing and a terrace with table and chairs to enjoy eating outside! There is so much to see and do for everyone with a fantastic selection of beaches, bars and restaurants, championship golf courses, tennis, water-sports, snorkelling, diving, cycling, fishing, paragliding, bowling, weekly outdoor markets, spas, children’s play areas, water-parks such as Aqualandia, theme parks such as Terramitica, museums and many historical sites of interest. The local Tourist Train and a regular bus service operates from outside our urbanisation (opposite the Carabassi bars and restaurants) and travels in a circular route around Gran Alacant, stopping near the Carabassi beach, supermarkets, shops, banks, pharmacies, bars, restaurants, Bhava Spa and the local market. GA Commercial Centre: there’s a good selection of bars, restaurants, supermarkets (Mercadona, Lidl and Consum), a variety of shops and boutiques, children’s play area, Burger King, Petrol Station, bicycle hire, gymnasium and tourist information. El Clot de Galvany Natural Park: (adjacent to our apartment) is a great place to walk, explore nature trails, observe birds and wildlife and relax in the picnic areas. The Clot offers visitors sightseeing and tours by reservation. Enjoy a heated indoor pool with hydro massage jets, bubble beds and Jacuzzi, a fully equipped gymnasium and a variety of fitness classes are available. Just a 5 minute drive or reached by taking the Tourist Train. A weekly outdoor market is held in Gran Alacant every Thursday morning and sells everything from local fruit and veg to leather shoes and handbags. Are available from Gran Alacant to various parts of Spain including Benidorm, Terra Mitica etc during the Summer months with pick up points nearby. If you fancy bowls then visit the bowling green at the Monte Mar Bowling and Social Club. Is also available in nearby Santa Pola for the more adventurous traveller! The Spanish resort of Los Arenales del Sol is about a 20 – 30 minute walk, where there are plenty of shops, bars, restaurants and fabulous sand-dune blue flag beaches. During the summer months there are sun loungers for hire, beach bars and a non-motorised water sports at the Life Beach Club where you can enjoy kayaking, kitesurfing, snorkelling etc. This beautiful old Spanish fishing town (just 10 minutes’ drive away) is home to one of the largest fishing fleets in the Mediterranean. There are beautiful blue flag sandy beaches, a lovely promenade, cafes, excellent fish restaurants, tapas bars, historical sites and a weekly outdoor market (Saturdays and Mondays). The historic Castillo de Fortaleza de Santa Pola in the main square is surrounded by lovely outdoor cafes and is a great place to sit and watch the world go by! Diving: for scuba diving and open water instruction is available. A beautiful Island which is protected by a marine reserve and surrounded by very clear and unpolluted waters. There are lovely restaurants and shops on Tabarca and it can be reached by taking a glass-bottomed boat from Santa Pola or Alicante. A fabulous international city (15 minutes’ drive away) with beautiful blue flag sandy beaches, a wonderful marina, many places of historical interest, including a medieval castle, exclusive shops, restaurants, tapas bars, open-air cafes, clubs, theatres, cinemas, parks and gardens. There is also a charming coastal railway which runs from Alicante up to Benidorm and Denia, stopping at many coastal resorts along the way. Elche (20 minutes’ drive away) has a history going back over 2000 years, contains the largest palm tree plantation in Europe and is now listed as a World Heritage site. History, monuments and culture form a rich combination in its historical centre, offering sites and attractions such as Roman Baths, Castle, Medieval Cathedral and numerous other historical sites. There are also great shops and pavement cafes and bars in this lovely town and a day is well spent visiting Elche. Safari Park: There is lovely little Safari Park just outside Elche. A lively resort (40 minutes’ drive away) where you can visit Aqualandia Water Park, Mundomar Animal Park, Terra Mitica and Terra Natura. A stunning village sitting on top of a mountain, giving beautiful views of the green valley with many other mountains in the background. Guadalest castle (Castell de Guadalest,) which can only be accessed by walking through a 15 foot long tunnel carved out of the rock and is known as the Portal de San Jose. When you get through the tunnel you see the old village houses and it feels like you have entered an ancient time. You can visit the restored house of the Orduna family to get an idea of what it used to be like living in ancient times in Guadalest. The magnificent Caves of Canelobre are just 24 kilometres inland from Alicante near Busot and are said to be Spain’s largest and deepest cave system. The stalactites and stalagmites are continuously growing and aided by the clever lighting take on the shapes and forms of all sorts of animals as well as giving the caves a cathedral like feel. The main attraction is the candelabra formation, from which the caves have taken their name. The caves are open all year and can only be visited as part of a guided tour. They do not close for siesta so make an ideal midday activity. The views from the entrance are simply stunning, and there is a small picnic area so that you can admire the vistas whilst enjoying your sandwiches and waiting for the next tour to begin. Algar Waterfalls (or Les Fonts de l’Algar or Fuentes del Algar) has stunning waterfalls, swimming areas, splash pools, rock formations, indigenous fauna & flora and walks beside the Rio Algar. The park is open all year round (see opening times) also features a picnic area, a natural museum, an arboretum, restaurants, a camping & barbecue area (including a bar). For families with small children we can arrange for a variety of baby equipment to be hired such as cots (with bedding), high chairs, car sets, booster seats, pushchairs/buggies, baby walkers/gyms, sterilizers, etc. A refundable security deposit of £150 is also required and a laundry charge of €50 is payable locally on arrival. Changeover days are flexible, depending on availability. Our representatives live nearby and meet all guests on arrival with keys to the apartment. We fell in love with Gran Alacant when we visited in 2000 and decided to buy our holiday home here. We visit several times a year ourselves and always find new places to visit and things to do. There is everything we need for a great holiday! 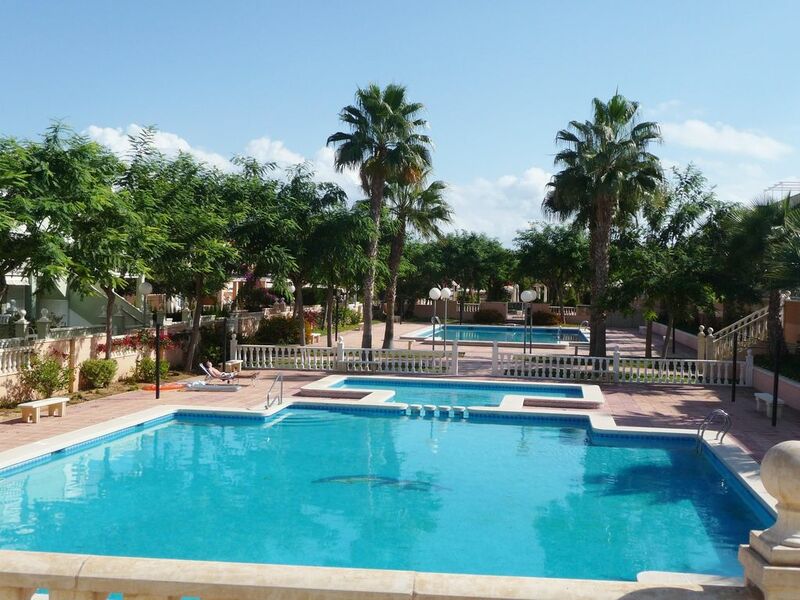 Our apartment is situated on the secure gated Mediterraneo 1 urbanisation with beautiful pools and tennis court. Its close to Alicante Airport, fabulous sandy beaches, bars, restaurants, bus route and tourist train. A fabulous holiday location! Our apartment is situated in one of the best locations in Gran Alacant. It is supplied with everything you will need for a great holiday, including Free super fast fibre optic WiFi, and UKTV. Bath and hand towels are provided, Beach towels are available to hire. Lounge/Dining Room with air con, heating and ceiling fans, UK Satellite TV, DVD player, books and games. Sofa and double sofa bed, dining table/chairs. Fully equipped kitchen with ceramic hob, oven, fridge, freezer, microwave, toaster, kettle, coffee maker, crockery, cutlery and cooking utensils. Also cool box for the beach. All FreeSat UK channels including catch up TV, movies and children's movies. Low rise terrace at front of apartment with table and chairs for outside dining. Outside terrace with table and chairs for outside dining and sunbeds in the garden area. Tennis Court on complex with floodlights. Tennis racquets provided. El Plantio golf course is about 15 minutes drive from the apartment and Alenda Golf is about 20 minutes away. Also Font del Llop Golf is a favourite of ours. 2 large pools, one with separate children's paddling pool. Full Air-conditioning and heating in the lounge/dining room and both bedrooms Multi-speed ceiling fans are fitted in both bedrooms and lounge for ultimate comfort all year round. All windows are fitted with mosquito nets . The lounge/dining area has a large double sofa bed, further 2 seat sofa, dining table and 4 chairs, Satellite TV, DVD,CD player, and lots of children's' videos, games and books. At the front of the apartment there is a large terrace and garden area for sunbathing, equipped with patio table / chairs and sunbeds. The gate from the garden area can be locked to stop small children getting out. Tennis racquets and balls are also provided to enable guests to use the tennis court also Boules set for use in area allocated. Bath towels are provided, but guests must bring their own beach towels. There are also beach bats and balls, buckets and spades for use by guests. Changeover day is flexible depending on availability. Arrival greeting was great. Angie and Joe very helpful and knowledgable. Property very well equipped. Local restaurants were very good. Especially Mykas kitchen and Tres Besos. Only downside was local taxi service recommended. On the occasions we used this particular company they turned up with the fare already started at €7 to €9. Other companies we used did not. Otherwise a great holiday. Would always use HomeAway. We are delighted that you both had a great time at our holiday home and hope to welcome you back again in the future. Really enjoyed our stay !!! The holiday was just what we needed. Ideal place for a short break. Clean and kitted out with everything you need. Bars / restaurants just around the corner. Spent the day in Santa Pola only 10 mins on the bus, really nice marina with lots of cafes. All in all a very nice place and good area with plenty to see and do. Thank you very much for taking the time to write a good review. We are delighted that you enjoyed your stay and hope to welcome you back again in the future. Also liz was very helpful. Thank you very much for the great review. We’re delighted that you enjoyed your stay at our apartment and that you had a great holiday. We had a great week in the apartment. It’s compact but has everything you need (including sat tv with kids channels and some movies) and all in great condition. The vernda/balcony got the sun in the morning (when not covered by unwelcome cloud!) so great for al fresco breakfasts. Otherwise it’s quite sheltered from the sun which keeps the property nice and cool. We barely needed the air con but when we did it was really quickly effective. The urbanisation has its own two pools 20 seconds walk away and it was clean and usually quiet (outside of peak season). Carabasi beach was 15 min walk away and it’s a lovely clean beach with a bar at the nearest entry point. A further 10 min walk gives access to a number of boardwalks off of the promenade to los arenales del sol which continues from Carabasi and is equally gorgeous. The apartment had buckets and spades, parasols, mats...everything you need for a day the beach which was wonderfully convenient. There are a collection of bars and restaurants on the other side of the pools, all of what we tried was good (but only tried 4 places). We ate a few times down los arenales del sol and seemed more like where the locals were but that could have just been the time of year. Overall, the apartment fit our needs perfectly and we enjoyed our stay very much. Thank you very much for taking the time to write a great review. We're delighted that you enjoyed your stay very much at our holiday apartment and hope to welcome you back again soon. Great hosts, nice clean apartment, great location. Had a few problems in the beginning with TV and internet not working, but the hosts along with their representative in Spain handled it well and sorted it out as quickly as they could. Great place, with superb location. Need to put information in the info book about where the Pharmacy is, as I got I’ll whilst I was there and couldn’t find a pharmacy. It was up towards the mountains, but if host had left postcode or address would have saved half a day. But all in all really enjoyed it, and would recommend. We are delighted to hear that you really enjoyed your holiday and apologies for the issue with the internet which was due to a technical fault on the community. The Pharmacy Is 5 mins drive up the hill and can also be reached by tourist train and local bus. The location is shown on the map which is sent to all guests with the information before departure, however we will ensure this information is clearer. We thank you for your feedback and hope to welcome you back again soon. Alicante-Elche Airport is only a 10 minute drive away from the apartment. The fabulous sand dune Catabassi Beach is just a 10 minute level walk from the apartment. There are plenty of bars and restaurants in Gran Alacant to suit all tastes and the nearest are just a 2 minute walk away at the Carabassi bars and restaurants. Tourist Train and a regular bus service operates from outside our urbanisation (opposite the Carabassi bars and restaurants) and travels in a circular route around Gran Alacant, stopping near the Carabassi beach, supermarkets, shops, banks, pharmacies, bars, restaurants, Bhavana Spa and the local market. If you wish to visit Alicante, Santa Pola or Elche, the bus stop is at the end of the road near the Carabassi Beach. Bhavana Spa: Enjoy a heated indoor pool with hydro massage jets, bubble beds and Jacuzzi, a fully equipped gymnasium and a variety of fitness classes are available. Just a 5 minute drive or reached by taking the Tourist Train. Local Market: A weekly outdoor market is held in Gran Alacant every Thursday morning and sells everything from local fruit and veg to leather shoes and handbags. Coach Trips: Are available from Gran Alacant to various parts of Spain including Benidorm, Terra Mitica etc during the Summer months with pick up points nearby. Bowls: Available at the Monte Mar Bowling and Social Club. Los Arenales del Sol: The Spanish resort of Los Arenales del Sol is about a 20 – 30 minute walk, where there are plenty of shops, bars, restaurants and fabulous sand-dune blue flag beaches. During the summer months there are sun loungers for hire, beach bars and a non-motorised water sports at the Life Beach Club where you can enjoy kayaking, kitesurfing, snorkelling etc. Santa Pola: This beautiful old Spanish fishing town (just 10 minutes’ drive away) is home to one of the largest fishing fleets in the Mediterranean. It is surrounded by large natural saltwater lagoons, which attract an abundance of wild birds and pink flamingos. Island of Tabarca: A beautiful Island which is protected by a marine reserve can be reached by taking a glass-bottomed boat from Santa Pola or Alicante. Elche: Elche (20 minutes’ drive away) Historical World Heritage site. Benidorm: A lively resort (40 minutes’ drive away) where you can visit Aqualandia Water Park, Mundomar Animal Park, Terra Mitica and Terra Natura. The local magazine 'GA Advertiser' is a free magazine and available from the bars and restaurants across the road at the Carabassi Centre, In this magazine you will be able to find out what is going on in the area, bars and restaurants to visit as well as local bus and tourist train timetables. To reserve accommodation a non-refundable deposit of 25% is required at the time of booking. The final balance, which is to be paid 10 weeks prior to departure. If booking within 10 weeks, full payment is required. A cleaning charge of 60 euros is payable locally to our agent. A refundable key/security deposit of £150 In the peak summer season, whilst we are flexible on changeover days, any guests wanting to book split weeks ie Monday to following Wednesday will be subject to a minimum charge of 11 days rental. Check in time is 2pm and Check out time is 10am. Holiday Insurance is recommended and owner is not liable for personal injury, loss of valuables etc.